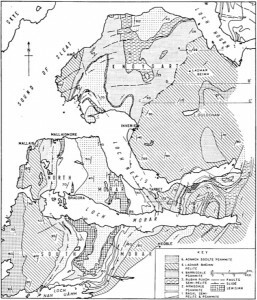 The Morar group of sediments (part of the Moine Group on North West Scotland) were deposited as a thick series of shallow water sediments, sands and silts some 800 million years ago in the latter part of the Cambrian Era. Subsequently they have been subjected to many phases of deformation where pressure and temperature have altered their structure to form the banded psammites and pelites that we see today. The complexity and intensity of the folding has only recently been partially understood and the relationship with the surrounding geology often remains mired in controversy and uncertainty. Large areas of the Moine, particularly those in Morar and Knoydart remain largely unmapped and mysterious allowing plenty of room for surprises and revelations in the Geological world. There are three recognized phases of deformation. The first is represented by isoclinal folds with a Lewisian core. 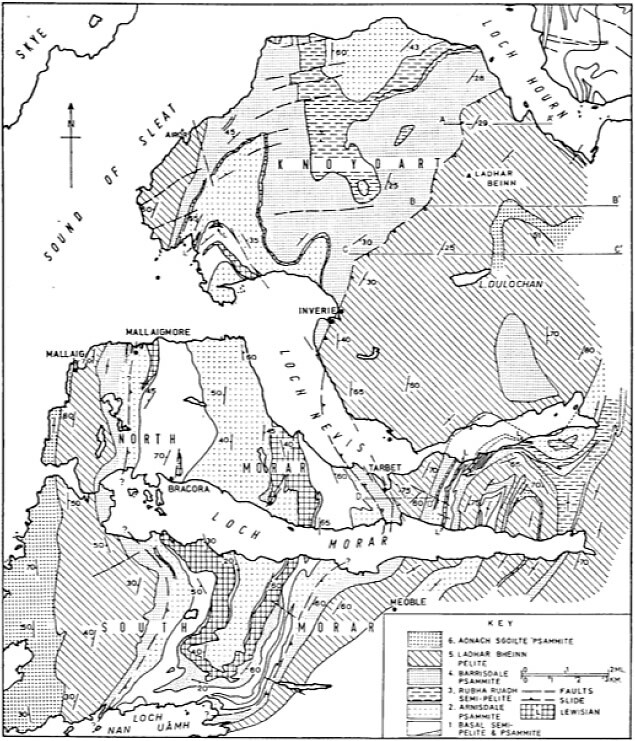 This phase was followed by recumbent folding period referred to as the Knoydart fold underlain by the Knoydart slide and the most recent phase of deformation is referred to as the Morar Antiform. The oldest period of deformation is represented by the core of ancient gneisses of the Lewisian formation which outcrop at surface in the cores of the major antiforms. Brinacory Island and the adjacent coastline is composed of a hornblendic gneiss of Lewisian age and it’s banded sugary texture can be seen in the rocky outcrops along the shore at this point. The second phase of deformation resulted in numerous faults that dissect the area and the regionally important low angle fault known as the Knoydart fold whose core is well exposed immediately to the west of Glen Tarbert. Localised faults are surprisingly extensive and one such is responsible for the narrow gully that connects Loch Morar and Loch Nevis. Indeed the continuation of the fault can be seen across Loch Nevis where it defines the peculiarly straight coastline that leads into Inverie Bay. Whilst Loch Morar lies entirely within the Moinian metasediments, (altered sands and silts) there are one or two geological anomalies which lie hidden in the craggy mountains that surround the loch. High above the shoreline, hidden in the crags above Ardnamurach is an unusual and notable outcrop known as the Sgurr Breac Pegmatite. This is a intrusive igneous rock, in this case estimated to be 827 to 784 Ma and is comprised of quartz, microcline, plagioclase, muscovite mica, biotite mica and garnets. If you can locate this hidden and remote piece of rock you might be lucky enough to find enough garnets for a decent piece of jewelry. There is one other known outcrop which lies in the abandoned village on Ardnish, but others may lie undiscovered in these remote hills. Pegmatitic veins containing abundant white plagioclase feldspar and sheets of muscovite mica can be found at many locations, notably north of Morar bay at Bourblach and high above the Eastern end of Loch Beoraid. Numerous “dykes” of Tertiary age (60Ma) can be identified by their differential erosion throughout the region. Typically composed of very dark green to black Dolerite or Basalt, they can easily be identified by their general NNW to SSE trend and the gullies and crags which they often define. At the very head of Loch Morar is a large intrusive body of Trondhjemite which forms the imposing rocky sentinel guarding the entrance to Glen Pean. A light coloured igneous rock rich in Oligoclase which is associated with the Caledonian Orogeny of the Scottish Highlands. Immediately to the East of Loch Morar lies the significant low angle fault know as the Sgurr Beag slide which can clearly be seen when driving the A830 towards the East end of Loch Eilt.